Calling all Garbage Patch Enthusiasts: NOAA Samples Plastics in North Pacific! Diagram of a manta net. Seawater enters the mouth and is filtered through a fine, mesh plankton net. Each tow is 15 minutes long, and filters a surface area equivalent to an Olympic-sized swimming pool, concentrating debris and critters at the “cod end” of the net. Image courtesy of NOAA Okeanos Explorer Program. Here at NOAA we don’t always have the opportunity to work together as much as we would like. But, sometimes, cool opportunities spring up really fast! So when some colleagues at the National Marine Fisheries Service told the us that among other important work at sea, that they were going to sample surface waters for plastics out in the Pacific Ocean for the NOAA Marine Debris Program (MDP) - well, there’s no other way to say it – we were totally psyched! A big thanks to NMFS for including us!!! The NOAA vessel Okeanos Explorer set out on its return trip to the mainland from Honolulu, HI on October 19 and will dock in San Francisco, CA on November 1, 2010. In addition to collecting lots of tiny plankton with something called a continuous plankton recorder, the scientists on the cruise are conducting three surface water trawls each day to assess the amount and composition of plastic in the North Pacific. That’s a lot of trawling! Enough of my blabbing – check out the OE blog (second to last paragraph) for cool info. and pictures! Sounds like a good project. It is really necessary to analyse, also chemically, floating marine debris. One question comes up though: how can it be avoided to catch fish or other marine fauna while dragging the manta? 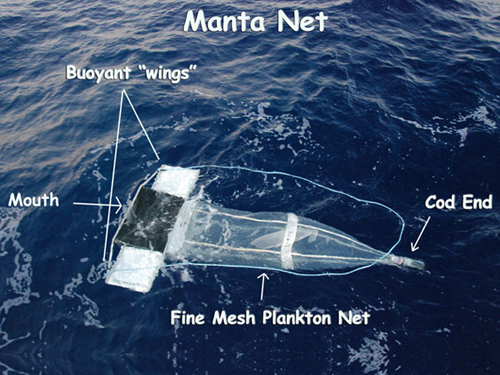 The manta net has buoyant wings on each side so it will glide half above water and half below water to quantitatively collect debris, plastic particles, and plankton larger than 1/100th of an inch (1/3 of a millimeter). 1/100th of an inch seems very small, but actually about half the zooplankton (microscopic animals) and almost all the phytoplankton (microscopic plants) are too small to be caught by the manta.